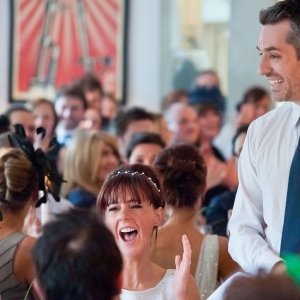 The Bride's Guide to Wedding Speeches - Super-Style-Your-Speeches! 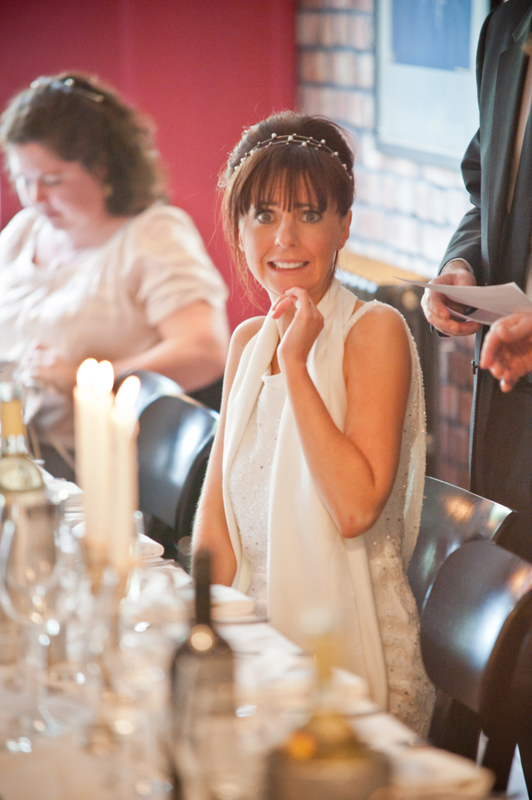 Brides often think the speeches are beyond their control. Insert finger shaking GIF of choice. Yes, despite popular belief (myths created by menfolk long, long ago), us girls do have a say in the speeches. Even if you opt not to give a speech yourself, you can still say a big fat NO to your wedding being hijacked by three blokes reciting clichés and Googled gags for an hour. 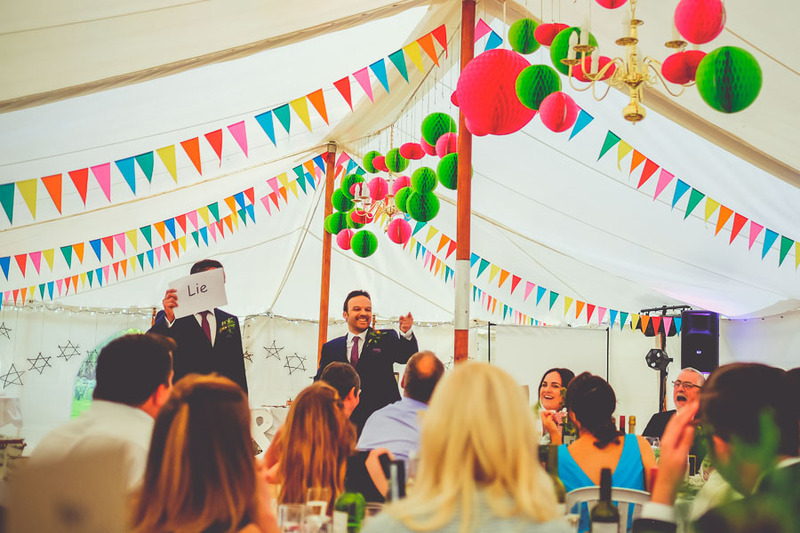 You don’t have to get all ‘control-ly’ about it, and we advise against auditioning best men, but there’s plenty of sensible ways to help super-style-the-speeches. As a team of ex BBC scriptwriters, the Speechy team have worked with everyone from Sharon Osbourne to Richard Hammond, and we know how to entertain audiences. Steal all our ideas– or just scroll to the bits that matter to you. 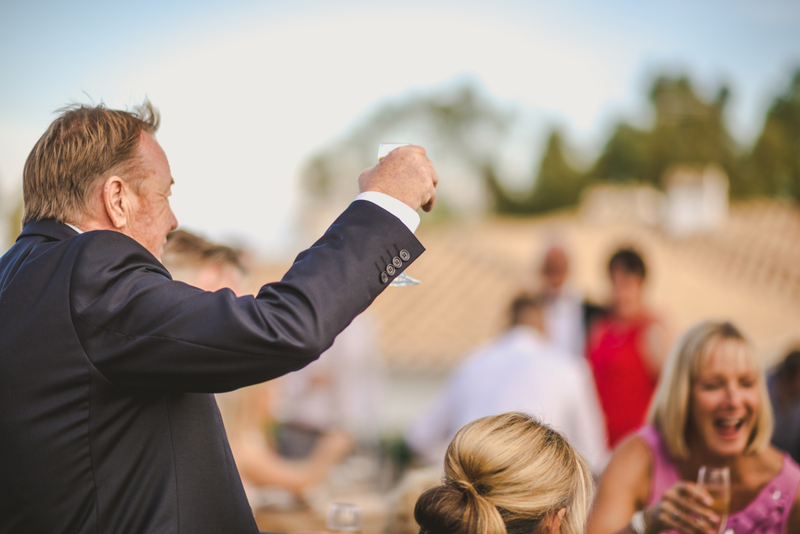 SPEECHES – YOUR GUESTS CARE ABOUT THEM. FACT. Great speeches (one of the few free and genuinely unique things at a wedding) should be slap, bang, at the core of every modern wedding. They provide the wedding’s heart. Without them, a wedding’s just a costly party (where people are invited to drink free champagne on the condition they sit through the vows without heckling). The party – was the DJ or band any good? How fun was it? You can rely on the final one, and you’ve no doubt thought about the first three. The fourth? Probably not. And that’s where a lot of brides are missing a trick. 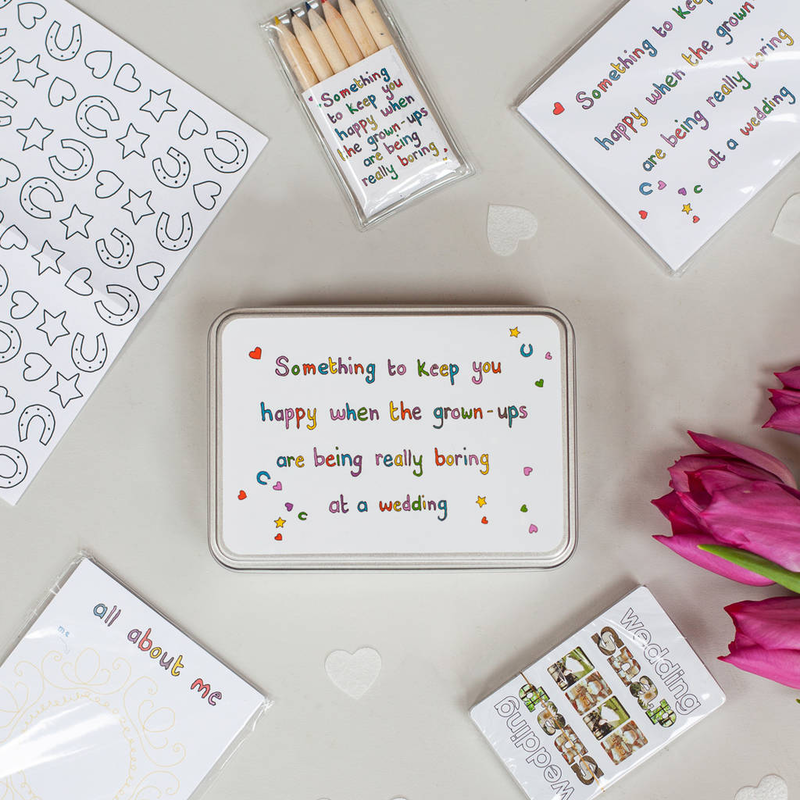 Yes, the speeches (not the colour scheme, the macaroon cake or even the homemade marmalade favours) has the power to get everyone laughing and loving a bit more. The speeches are not like the transport; they shouldn’t just be palmed off on your bloke. They’re a once-in-a-lifetime opportunity to drop a massive love-bomb on the people you rate. Make the most of them. If you want to go down the traditional father, groom, best man route, that’s fine but at least question it. Guests love it when women get involved (even today, it still feels unusual) so think about who you’d like to hear from on the day. Maybe it’s your sister saying a few words, or perhaps it’s your nan sharing her comedy tips for a long & happy marriage – just try to get a Mrs behind that mic. Of course, there’s you to consider. Brides shouldn’t feel pressure to do anything they don’t fancy, but we can personally vouch for the fact a bride’s speech is FUN. Check out our experience of grabbing the mic and why loads of ballsy brides are saying #thisbridewill. If you’re tempted, our bride speech advice will help you nail it or our bride speech template is a great starting point. Another option is delivering a Mr & Mrs Speech – where you present a speech together. 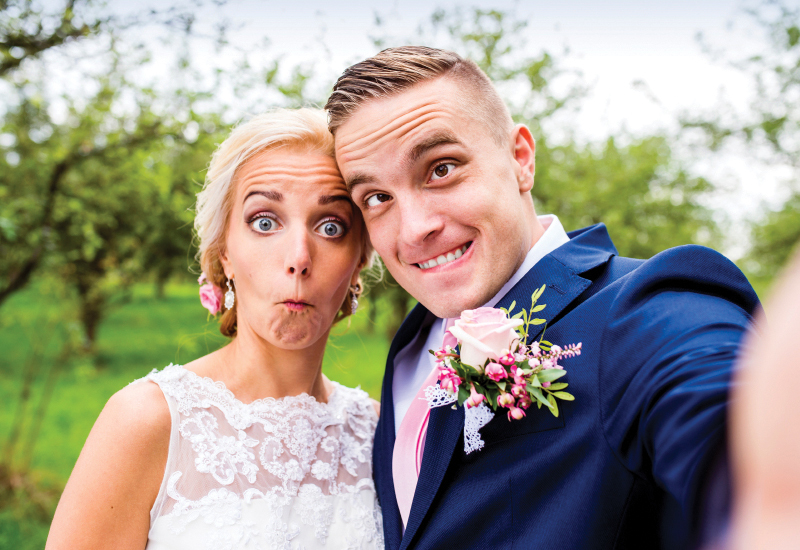 This takes the pressure off you & the groom and allows you to develop your double-act. Guests love it, it’s kind of cool and a joint speech is always blooming funny – esp if you read our advice. Of course, don’t just think about the obvious speakers – think inventively. Young children always have comedic things to say about love, and it’s great if you have an elderly relative who can add some suitably cynical advice. Contributions needn’t be long, in fact, better if they’re not. Quirky and cute is what we’re after. The easiest way to kick off is to decide on your dream line up and then work out if anyone would be upset by it. If the answer is yes, consider inviting them to give a short speech too, or even better, a reading (whereby their contribution is ‘contained’). Re. the risqué best man… it really depends on how the groom feels. Don’t put pressure on him to drop his mate, but if he’s also nervous about ‘Mad Pete’s’ contribution, suggest your groom recruits a ‘best man squad’. If several of his mates divvy up the best man duties, it’s legitimate to put Pete in charge of the rings and Sensible Sam on speech-duty. If that all feels too awkward, then it’s just a matter of sucking it up. As much as the speeches have the power to add something marvellous to your day, they certainly shouldn’t add additional stress. Don’t start thinking they all need to be Oscar-worthy and don’t feel you’re responsible for the words coming out of other people’s mouths. Ultimately you need to sit back and hope people say nice things about you. Rest assured, everyone expects the best man to be completely inappropriate anyway. It’s an honour to be asked to speak at a wedding – so make the most of it. 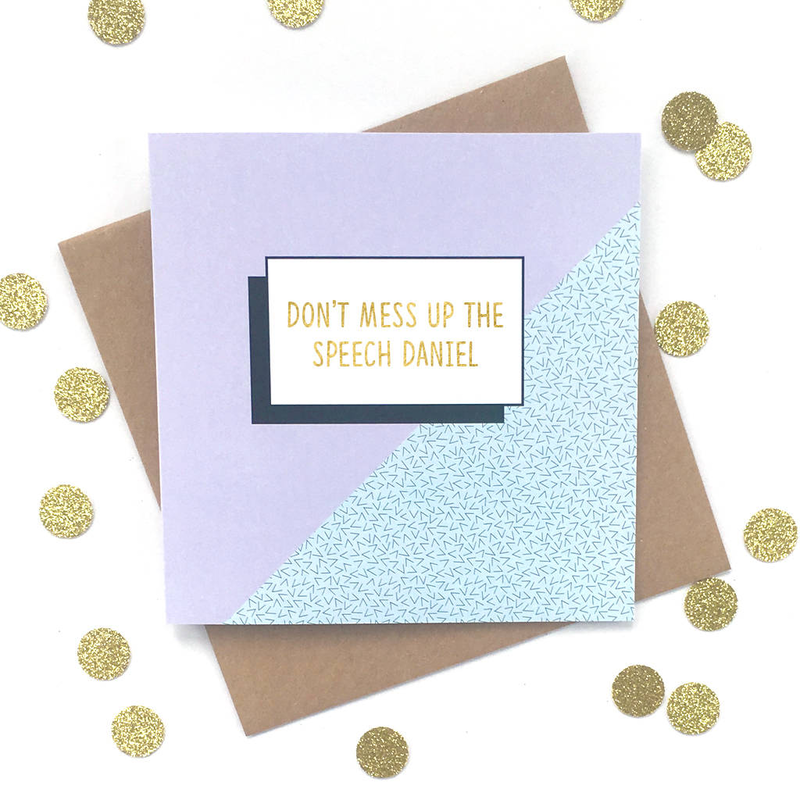 We love these cheeky ‘Don’t Mess Up the Speech’ cards from Not On The High Street. We get it, we do. But before you leave him to his solo-speech-writing, remember, if you’re not giving a speech, he’s officially your representative. That means you can’t sit beside him on the day, rolling your eyes, heckling ‘get on with it’ and shouting ‘that so didn’t happen’. 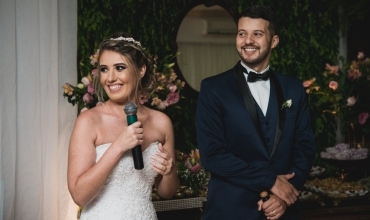 Clearly, you want your groom’s speech to be heartfelt, original and you know, downright amazing but remember there’s a lot of pressure on him. 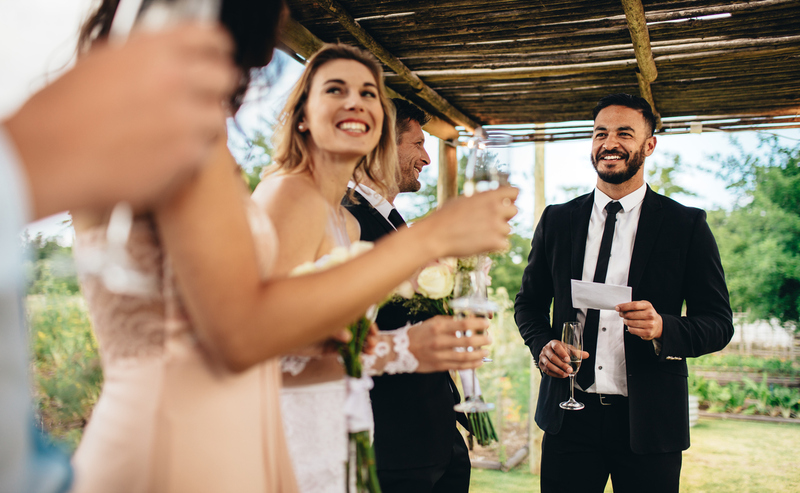 He has the most speech ‘to dos’ (thanking guests, toasting bridesmaids, blah de blah) so don’t let him wallow in panic and resort to dodgy templates (though a Speechy groom template would be fine!). Whether or not you’re giving a bride’s speech, you need to have a proper discussion about the thank yous. Swot up on the old school etiquette on Confetti, but check out our groom speech advice if you want his thank yous to sound less like a clichéd list (clue: don’t use clichés). If you’re feeling really kind (or just a bit ‘control-ly’) you could suggest a ‘speech-session’, which basically involves cracking open some alcohol and conducting a courtship autopsy. 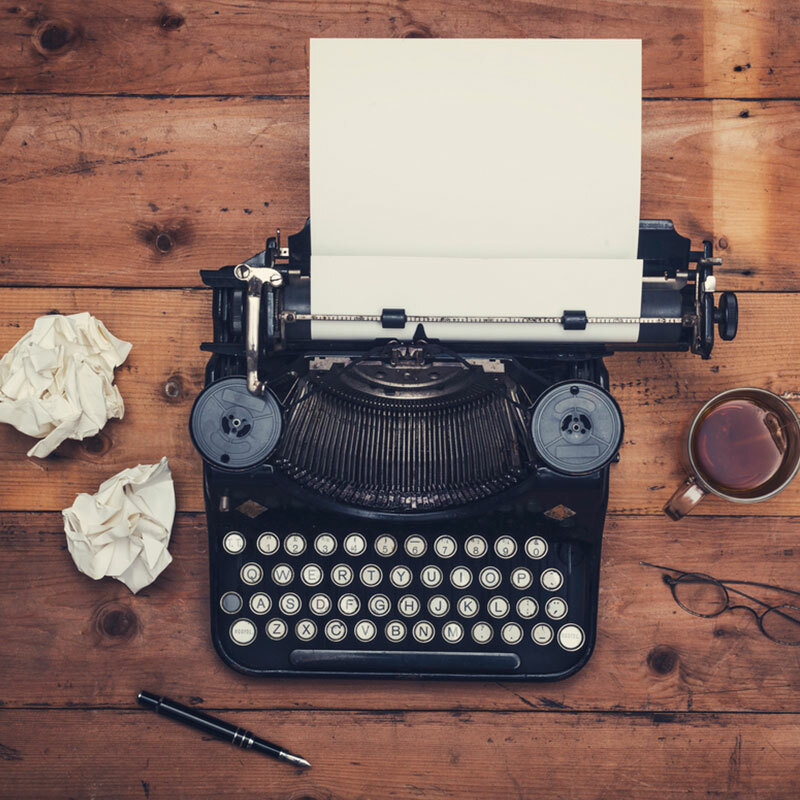 Find those funny stories and hunt down the cracking anecdotes. Two heads are definitely better than one (even if they’re slightly sozzled after a bit too much of the Shiraz). Obviously, you’re not allowed to help him with the romantic bit, but as long as you’re not presenting him with a laminated infographic highlighting all your wonderful qualities and life achievements, then he still has the sentimental bit to deal with himself. Of course, writing the speech is only half the battle. 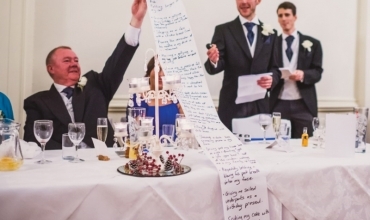 If your groom’s the nervous sort, make sure he reads how to deliver your speech like a pro. It’s got lots of advice in it from our years working with at the BBC and directing presenters, but if you feel he needs more of a helping hand our Delivery Coaching Service might put him (and you) at ease. And, for the other man in your life, you might want to pass on the link to our father of the bride speech advice. 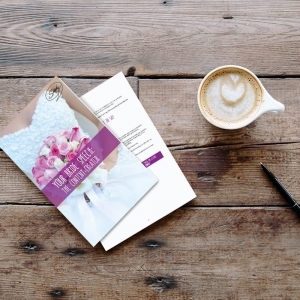 A great speech hack… Ask guests for their ‘marriage advice’ when you send out the invites. It can provide great material for you or the groom and people love to get a name-check in the speeches. The advice we received ranged from ‘find a thermostat temperature you can both live with and never change it’ to ‘no number twos in front of each other’. Humorous and wise. There’s obviously options like Speech Bingo, but the novelty’s wearing thin. If you have the time to create your own personalised versions (with references to classic anecdotes like ‘the Ibiza incident’) then it’ll feel less of an ‘add-on’ and more genuinely funny. 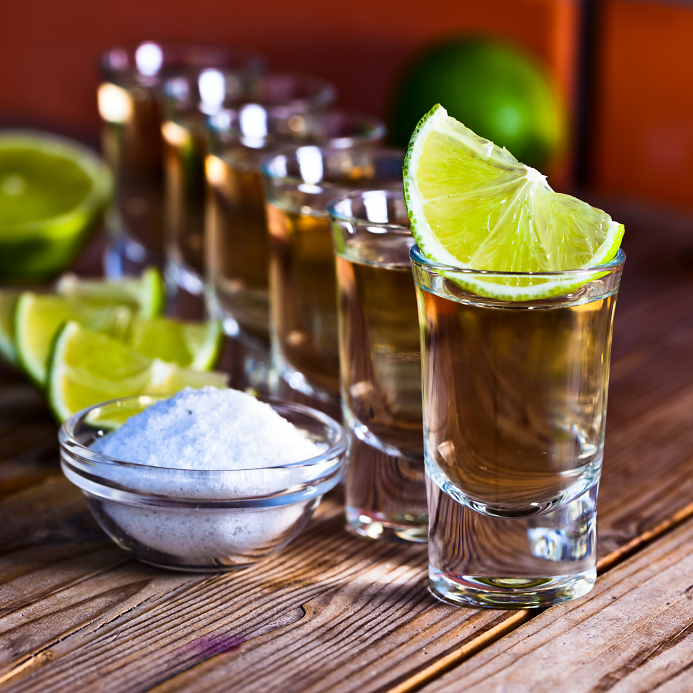 Another idea is #spontaneous speeches’ – a concept stolen from the continent where it’s not unusual for everyone to propose a toast to the newlyweds. Basically, there are no formal speeches but invites encourage guests to ‘feel free to call for silence and say something (nice!) or read a verse, or just say Hooray or raise a toast’. Toasts are then proposed between the courses of the wedding meal. This works for boho weddings because it’s casual, cool and generally gets funnier as more wine is consumed. Take any gift-giving out of the speeches. It’s not the time or the place. Yes, it’s nice to give the mums flowers, and your best women will appreciate her bling, but deliver your gifts personally rather than in front of a crowd. It’s always awkward if you include it in the speeches (both logistically and editorially) – so don’t give your guests an excuse to start checking their WhatsApp messages. Gone are the days when we need to toast the ‘health and happiness of the happy couple’ with a glass of Champagne. Toasts should reflect the couple getting hitched whether that’s a shot of tequila, a glug of bourbon or a sip of Indian chai. Be inventive but equally don’t be insulted if your nan rejects the Jack Daniels option. Remember to drop the tired clichés and toast something meaningful to you. Perhaps ‘decades of dancing on tables and inspiring each other’s tattoos’. If either you or your groom has lost a close relative, we recommend reading our Dearly Departed post. 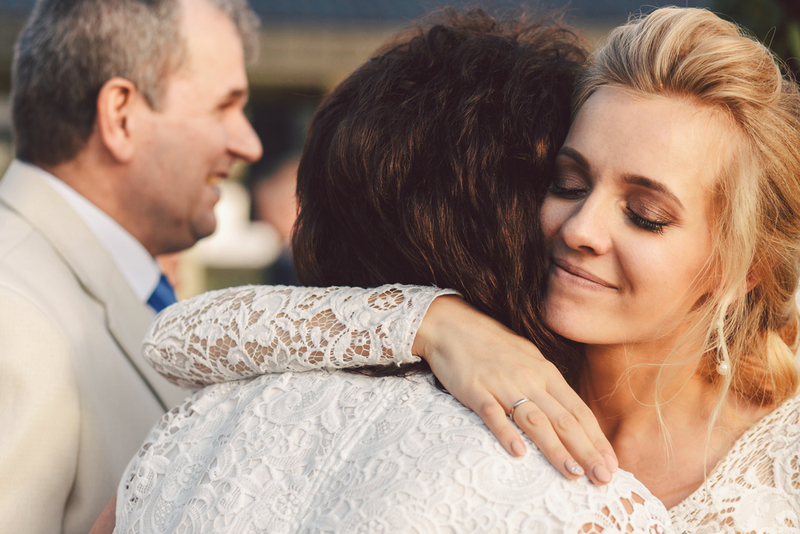 Even when people think they’ve come to terms with the loss, a wedding is a highly emotional day, so it’s worth thinking about the best ways to honour your loved ones without the speeches turning into eulogies. You want the speeches to remain joyful, and your loved ones want to be remembered with a smile. 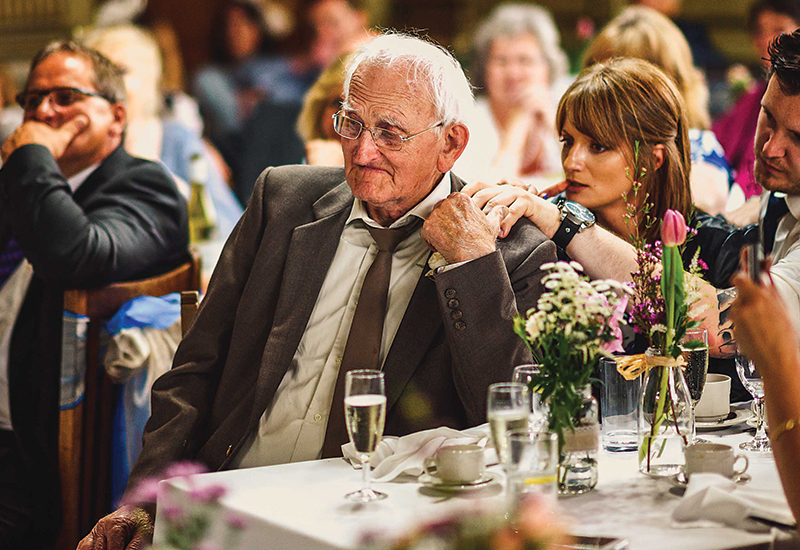 If either you or the groom has lost a parent, consider planning a dinner in the run-up to the wedding, where you pay a special tribute to them and shed a lot of those tears in advance of the day. Couples often find it comforting to have a proper chance to honour their loved one’s absence without it taking over the actual day. 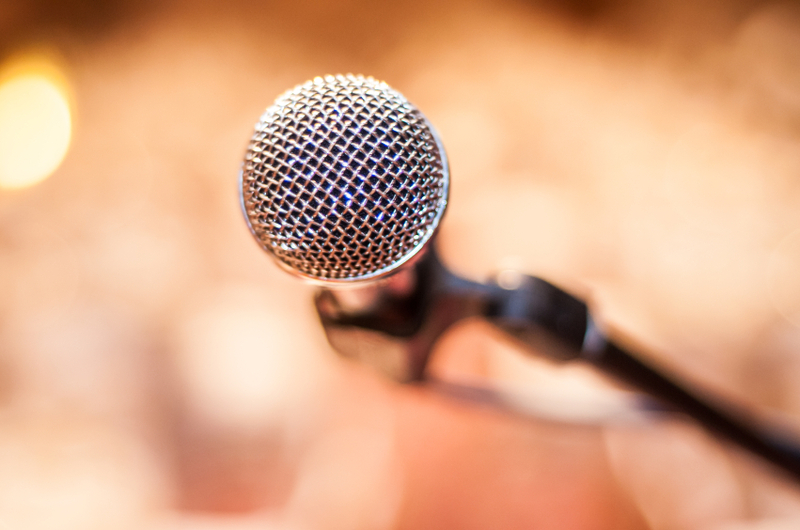 Avoid the ‘speech clump’ and get clever with how you schedule the speeches. An hour of speeches is enough to leave even your mum wondering if she can nip outside for a quick fag! Think about dotting the speeches throughout the day. Schedule one between each course of the wedding meal so everyone can enjoy the interjection and they don’t tire of the stand-up, sit-down palaver of three toasts in quick succession. Another option is to schedule the ‘main act’ (whoever that may be) for the evening do. Maybe it’s the surprise bride speech, or the naughty best man – whoever it is; it’s a great way of making the b-list invitees feel part of the whole day. You’ve no idea how many speeches are ruined simply because people can’t hear them. People spend days honing their humour, only for the joke to get lost in the bad acoustics of a shiny floored hall. Luckily there’s an easy solution. Hire a mic and make sure someone tests it on the morning. Of course the ultimate distraction during the speeches… children. As cute as they are (sometimes), it’s preferable if they are not involved in the heckling of speakers. Activity packs are essential. Here are some good ones that might raise a smile from the adults too. Hope you’ve found our advice useful! Wedding speech delivery is just as important as writing a great speech. As ex BBC TV directors, we’re trained to get the best out of you and teach you the tricks of the presenting trade. The Masterclass is a one-to-one Skype call with one of the Speechy team that will take between 45 and 60 mins. We’ve worked with numerous celebrities and countless comedians as part of our TV career helping them to get into their comfort zone and deliver the goods and, with a few simple tips, we guarantee you will too! We’ll ask you to present your speech before giving you feedback & presenting tips, and then get keep on rehearsing it until we feel you’ve got it. You’ll inevitably see immediate an improvement but we’ll also send you a personalised email with everything you need practise and remember on the day. It’s basically The Cheat’s Guide to Nailing It. Once purchased, we’ll be in touch to set up the Masterclass Skype call or you can call us in advance to check our available time-slots. Purchase a Wedding Speech Review and the Speechy wordsmiths will ensure it’s a speech to remember for all the right reasons. Once purchased, simply upload your speech when prompted and our experts will ensure it passes all the etiquette and story-telling tests. 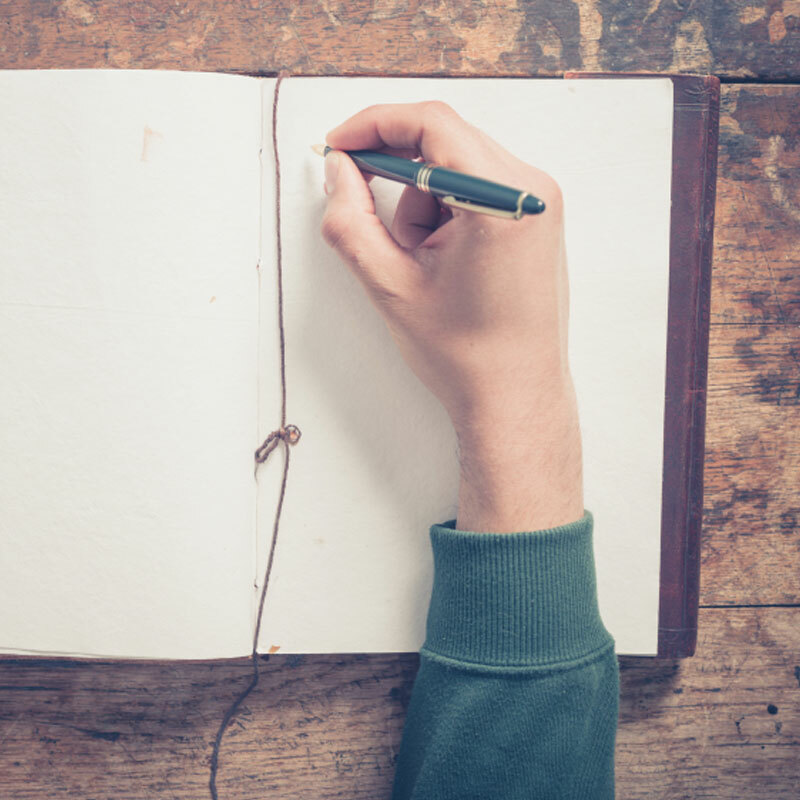 We’ll also rewrite any sections that we feel are lacking and ensure your speech is one you can’t wait to deliver. Your ‘Reviewed Speech’ will be emailed to you within 48 hours of purchase. Further detail can be found below. Commission the Speechy wordsmiths to craft a bespoke (and rather brilliant) wedding speech for you. Buy today and we’ll get the ball rolling. Please ensure you’ve booked your speech into our calendar before purchasing. Call us on 07971 225 245 if you haven’t already. Speechy’s Bride Speech Template will not only help you write a wonderful wedding speech, it will turn you into a natural storyteller! It comes with a Content-Creator (guaranteed to extract brilliant material from even the most uninspired) and a choice of three speeches that our team have crafted for you to simply pick your favourite and then personalise. 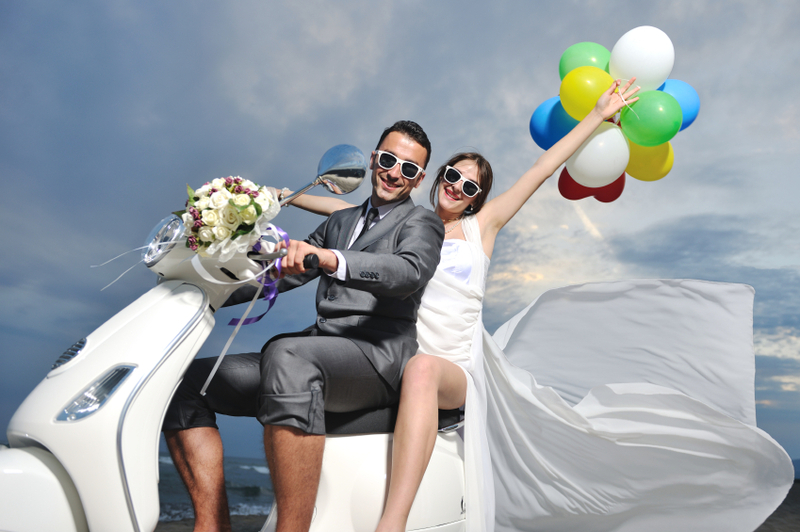 Fun, clever and possibly the best wedding investment you could make.